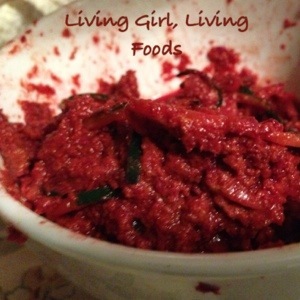 I’ve shared a “beetball” recipe before but this beet sauce recipe is far too divine to not post. My mom was having a traditional spaghetti and ground meat pasta dinner and I felt like creating something that would look similar to her meal but of course a living plant based version. If you’d prefer you may use zucchini instead of cucumber, and you can peel either vegetable if you do not want the green peel being shown so a more authentic pasta look can me attained. When I am making food just for myself I am not as picking about such things, plus the skin has oodles of nutrients too! Many of my clients enjoy the zucchini noodles slightly blanched or they even use other types of squash. To make this traditional noodle shape I recommend a spiralizer, here is a link to the exact one I use in my home. In the photo shown on Amazon I use the attachment to the far left that makes thinner noodles. The base of this beet sauce is pulp from juicing ❤ This is a fun, delicious and nutritious way of getting more minerals and vegetables into ones meal. I’ve mentioned this numerous times now but pulp from juicing is great for creating desserts, salads, dips, dressings, or like in this dish even being able to hold strong as the main element that ties the ingredients together. 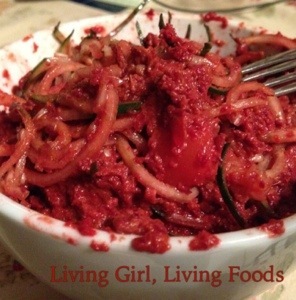 I used a spiralizer and a blender for this recipe plus an excellent chef knife. I am guessing it took me around 5-8 minutes to prepare this, I had the vegetable pulp all ready to go for the recipe! This recipe works perfectly for Sloppy Joes or whatever people are calling them now ;P hahaha just add a chili/chipotle mix about 1 teaspoon to 1 tablespoon and 1 teaspoon to 1 tablespoon of coconut aminos. YUM! A dash of the following spices all dried: thyme, oregano, rosemary, black pepper, cayenne, celery seed, turmeric, cumin, and marjoram. If you would like feel free to add a teaspoon of your preferred vinegar, possibly apple cider vinegar or coconut vinegar. Like I mentioned earlier there are just a few easy modifications to turn this into a Sloppy Joe mix :D! I love messy foods! Oodles of fun to eat hahaha. I found this to have a very sweet, savory and comforting feel. The textures were excellent and the ingredients compliment one another so beautifully. I hope you all have the chance to try this recipe out. Or may be feel inspired to make some of your own vegetable pulp based dishes. Thank you all dearly for taking the time out of your day to read my post. Wishing you all a magical and delicious week. Much love ❤ and raw power 😉 My next post will be a Q&A so please feel free to shoot me an e-mail at livinggirllivingfoods@gmail.com or leave me a comment. It’s always a pleasure to have a chance to connect with you all. That sounds really good! I try to eat mostly raw foods for breakfasts and lunches and I might have to give this a try! Thanks for sharing!